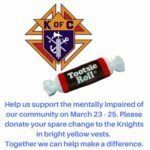 Thank you to all those who contributed to this drive on the weekend of March 23 – 25 and to all the Knights and their helpers who braved the cold to help the less fortunate. Preliminary totals are in and it appears that our council collected well over $1500 to help our mentally impaired brothers and sisters. Details on which charities will receive these funds will be available after our next monthly meting. With your help we can make a difference in the lives of so many who need our help. Thank you.